If the word “coffin” makes you think of a plain wooden box, it might be time to update your perception. Today, coffins are increasingly becoming a personalised reflection of the deceased. In fact the UK largest coffin manufacturer has stated that non-traditional coffins now make up 10% of all orders. And that number is growing fast. Colourful coffins provide consumers the opportunity to inject a bold, personalised touch to the funeral and burial process. “More and more, people are deciding to choose designs which reflect their loved ones’ lives,” explains Richard Halliday, director of Halliday Funeral Supplies. While the UK is just starting to adopt to idea of colourful, personalised coffins, Ghana has been perfecting this art form for decades. Ghanian funerals are elaborate affairs, and people take great pride in creating coffins that reflect the deceased’s life and personality. These often intricate designs vary from cars to crops to aeroplanes, and are recognised as true works of art. Each coffin holds a symbolic meaning, which is why they are also known as “proverbial coffins”. The British are yet to have the range of offering the Ghanian are accustom too but the UK’s taste for a greater variety of coffins options is only growing. If you have a passion for all things football, following your team every season and proudly wearing your team’s colours having a personalised coffin designed with a team’s colours, crest, or even photo of their stadium, is a way to express that passion, even after death. National flags, paintings of favourite vacation spots or even a photograph of your own backyard garden can now be printed onto a coffin. New technology means that the only limitation is your imagination and personalised coffins provide a meaningful way to reflect the values, personality, and the life of the person that has died. The ability for people to design their own coffin and personalise their funeral is quickly growing into a cultural norm. There are now dozens of websites where people can create their own design, or select from a wide variety of images and statements that reflect a personal belief. More traditional wooden coffins can be painted, have images printed on them, or decorated to fit an unlimited range of tastes. Greenfield offers a variety of personalised coffins, with a range of materials, colours, and printing options. Their online coffin designer allows customers to upload pictures and images, add text, and have their creation delivered worldwide. Pathway provides biodegradable wooden coffins, arranged in panels that are each individually designed. This allows for multiple people to create their own sections, or for various sections to represent different parts of someone’s life. Pathway also offers printed interiors. Pathway works with funeral directors throughout the UK, where consumers can create logins and work together to create their designs. J.C Atkinson and Sons allows customers to create bespoke coffin designs from scratch, or select from their range of original designs. Customers can use their website to design the coffin, but delivery is arranged through a local funeral provider. Many people decorate cardboard coffins themselves, as they can be drawn or written on directly. Decoration can become a participatory event, during which loved ones gather to express their love and grief through the hands-on creation of this artwork. Written messages, mementoes, keepsakes, photographs, flowers, and fabrics can all be attached to cardboard coffins, turning the box into a personalised physical memorial. Wicker coffins also offer opportunities to create a colourful, personalised design. Wicker coffins come in a variety of shapes and colours, and are made from materials like willow, rattan, or reeds and grasses. Wicker coffins often come with rings or other designated places to attach flowers, ribbons, or special personal items. Wicker lends itself easily to personalisation, as greenery, flowers, or other items can be attached through the weave of the coffin. Many people select an arrangement of flowers or greenery for the top of the coffin. Garland and bows are often attached to the sides, encasing the coffin in a beautiful, environmentally friendly arrangement. Learn more about Funeral flowers and their true meaning in our dedicated article. 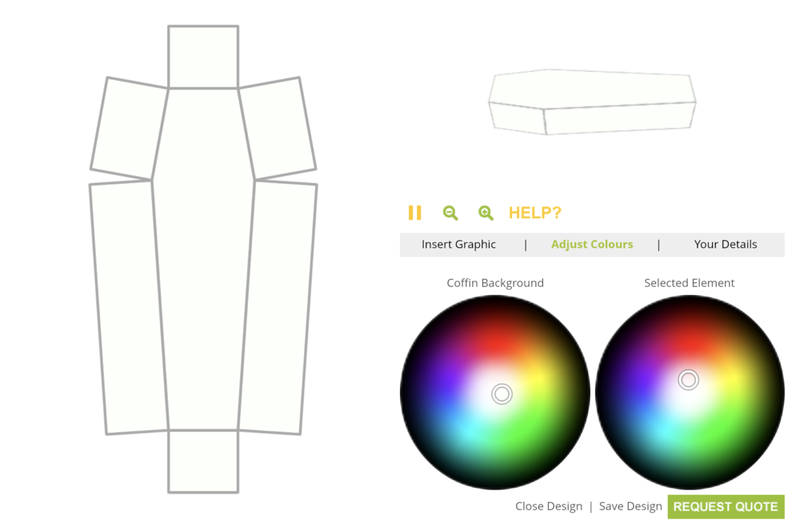 The options for designing a beautiful, personalised coffin are endless. Yet, barriers still exist in allowing consumers full cost transparency. Most companies do not post prices for their personalised coffins online, making it difficult for families to make informed decisions. If the funeral industry is truly serious about offering people more choice, we should be doing more to increase transparency. At Willow we’re working hard bring more clarity to funeral pricing and we'll update this article and our site as soon we've found manufacturers that support our view. Do you have a question about colourful coffins? Contact us at ask@thinkwillow.com with your query we’ll do our best to help. 1. Do I have to buy a picture coffin from a Funeral Director? No. You can purchase the coffin online at Willlow and have it sent to a Funeral Director or a home. 2. Can a picture coffin be cremated? 3. Can a picture coffin be buried? 4. Can a picture coffin be carried? Yes, but make sure the coffin has functional load-bearing or cutout handles. Yes, cardboard coffins can be painted, have notes and last words written on them or pictures with your memories attached. However weighty items may damage the structure of the coffin.